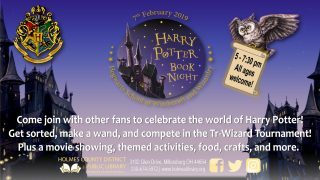 Come join with other fans to celebrate the world of Harry Potter! Get sorted, make a wand, and compete in the Tr-Wizard Tournament! Plus a movie showing, themed activities, food, crafts, and more.